Free transfers running to the North Terminal take approx 2 mins. 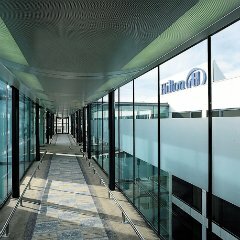 The Hilton Hotel is attached to Gatwick South Terminal by a short enclosed walkway. All rooms have en-suite bathroom, tea and coffee tray, climate control, telephone, satellite TV with flight information, radio, trouser press and hair dryer. 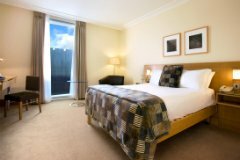 Executive rooms available. Bookings with rates that include 8 or 15 days parking will be parking at the South terminal long term car park. Check in at the hotel first where you will be given a voucher and directions. Not required for South Terminal, there is a free monorail link running between North and South Terminal - journey takes approximately 2 minutes. The Garden restaurant, Amy's Restaurant and two bars. Up to the age of 10, one child per adult eats free in the restaurant when the adult is having a meal. 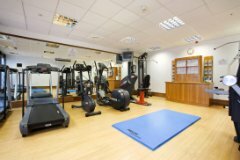 Within the hotel there is a LivingWell Express gymnasium. 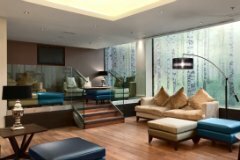 An executive lounge is available to clients who book executive room in the hotel, where refreshments are available. Family 5 will be in two interconnecting rooms or 2 rooms next door, a double and a twin bedded room. (plus a rollaway bed if for a family of 5). Children in this family accomodation must be 15 or under. Just one of the many Hotels near Gatwick Airport available from FHR. Good hotel. Not as conveniently located as the north terminal Hilton but a good second. Clean adequate for one night.Restaurent ok.
Clean basic room ideal for a one night stay.Food good plenty of choice. The hotel was fine and we always stay overnight if we have an early flight next day.We would like to highly commend the service we received when booking through FHR.The impenetrable website for Hilton was more than usually difficult and your fhr lady was initially unable to make a booking for us.The hotel site led us to believe it was not even open in Jan.1918! We decided to give up and try later,nearer the date. However your operator took the trouble to phone us back to say that she had persevered with the hotel and could make the booking for us,which we did. YOUR SERVICE WAS EXCELLENT AND YOUR OPERATOR IS TO BE PRAISED FOR HER FOLLOWING THIS UP AND SHOWING INITIATIVE>THANKS! 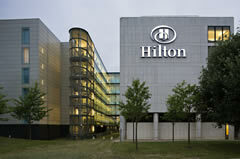 I have stayed at the Hilton Gatwick on numerous occasions. It is an excellent hotel and so convenient for the South Terminal. ( just a short walk ) Dinner is quite expensive but you can always take the short walk to Wetherspoons in the terminal. Easy, friendly check-in. Nice room, good to stay the night before your flight and know you will be on time. Good meal at Amy's - nice start to a holiday. Only complaint - we booked a 5 o'clock wake up call, which never happened. Very conveniently sited hotel and easy to reach by coach. Very comfortable room at a fair price. My only criticism is that the curtain didn't fit across the window, but this wan't a problem as I needed an early call for my flight. Good standard room only negative was that the plug got jammed in the sink. Comfy, clean and tidy and very convenient for Gatwick airport. From the M23 take Exit 9 for Gatwick Airport.At the first roundabout take the first exit to the South Terminal.Follow the signs for the Gatwick Hilton Hotel and car park. Family's of 5 will be in two interconnecting rooms, a double and a twin bedded room, plus a rollaway bed. Children in this family accomodation must be 15 or under. 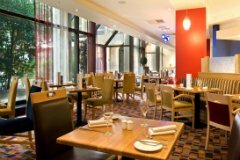 ***Children aged 10 or under can eat & drink for free at the breakfast, lunch and dinner buffet. Offer available when dining with a resident adult in the Garden Restaurant. For bookings with rates that include 8 or15 days parking, check in at the hotel first where you will be given a voucher and directions then clients take their own car to the South terminal long term car park. 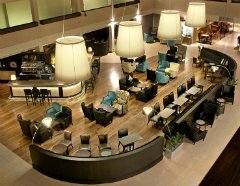 View all Gatwick Airport Hotel options available from FHR.